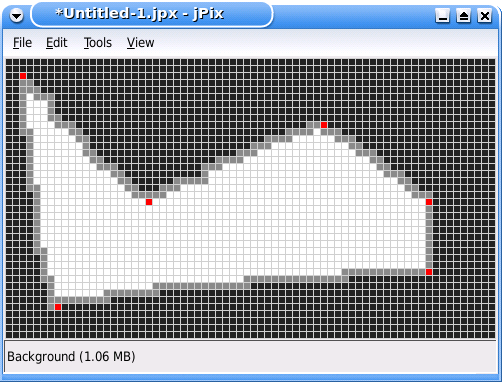 jPix is a new, very promising, open source bitmap editor. As the project is in a very alpha stage of development, currently jPix supports only 3 colors: white, grey and black. Other features of jPix include drawing straight lines with grey color and floodfill with black color. However, the most promising and coolest feature of jPix is the ability to work with images of vast sizes. One of the features that is urgently needed among its users is the ability to report the number of pixels of each color in the image. The developers of jPix, unable to come up with an efficient solution, asked us, the IPSC team, for help. Since we are lost too, we ask you to help us. A jPix image is X pixels wide and Y pixels high. The pixel (0,0) is the upper left corner, and the pixel (X-1,Y-1) is the lower right corner. When jPix starts, the image is completely white. Given the list of the commands issued by the user, your task is to implement the requested feature which will count the number of pixels of each color. Each test case looks as follows: The first line contains two positive integers X and Y, the width and height of the image. The following line contains N – the number of line segments drawn by the user. Each of the following N lines contains four positive integers x1, y1, x2, y2 describing the two endpoints (x1,y1) and (x2,y2) of a line segment. You may assume that the line segments are given in order and correctly describe a simple polygon which is not touching the border of the image. The exact mathematical object defined by the N line segments is a simple polygon, that is, any pair of consecutive edges has one point in common (the common vertex) and no pair of edges that are not consecutive has a point in common. The lines are given in the order in which they occur on the polygon's boundary. That is, the second line must start where the first ended, third must start where the second ended etc., and the last line must end where the first one started. After the lines are painted in jPix, no grey pixel will lie on the border of the image. For each test case output a line with three positive integers – the number of pixels of white, grey, and black color, respectively. The image shows a typical jPix session corresponding to the third example input. For your convenience the line endpoints are shown in red. In the actual image produced by jPix these points are grey.